The beach volleyball team to beat at this year's Olympics consisted of Kerri Walsh Jennings and her new partner, April Ross. But they will not be going home with the gold. If things go well on Thursday, Aug. 17, the most they can hope for is a bronze medal. They'll be up against another Brazilian team, which lost to Germany on Aug. 15. For most, that would be an extreme disappointment, and Walsh Jennings is no different. She's upset, even devastated. But she's also a great sport, and is often gracious when losing. 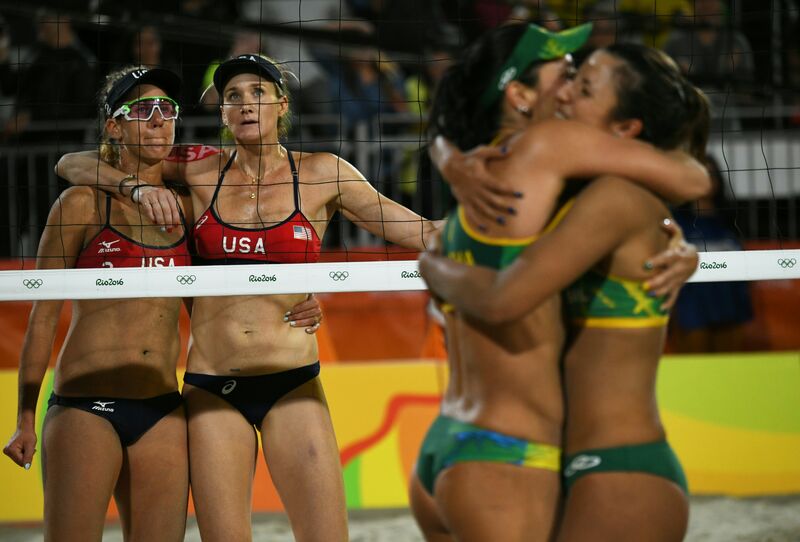 This tweet shows that how Kerri Walsh Jennings loses is just as moving as how she wins. Sent out by Associated Press basketball writer Tim Reynolds, the kind words honor her sportsmanship. Here's what he wrote from his account @ByTimReynolds: "For 12 years Kerri Walsh Jennings showed how to win with grace. Tonight she showed how to lose with grace." Following the loss, she stood with her arm around her partner as the Brazilian team across the net hugged it out and the largely Brazilian crowd cheered them on. "To not go to the finals of the Olympics Games is absolutely devastating," she told ESPN. But you wouldn't know it from her actions. You gotta pass the ball to win matches. I don’t know how many aces they got on me in that game. Four, maybe? That’s unacceptable and inexcusable ... I wasn’t passing the ball. You see a weakness and you go after it, and my weakness tonight was passing the ball. No blame game. Not the fans cheering for the other team, not her partner Ross, not anything. She even had good things to say about the other team. "We could squash that team, and we have in the past. I say that with so much respect, because they are very good. Tonight, they rose to the occasion. I certainly did not, and there’s no excuse for it," she told the paper. Agatha Bednarczuk and Barbara Seixas won both matches, 22-20 and 22-18. ESPN reported that Walsh Jennings is now 38 and will be 42 at the 2020 Games. They asked her whether she'd be going for the gold again. Her response is telling of her respect for herself and the game. "I know I can. I don't know if I will. I want to win my match tomorrow and I want to go home with a bronze medal," she told ESPN. The last time she won, her first act as a gold medalist was to invite one of the silver medalists — whom she had just beaten — to team up with her to win the gold in Rio. That was her now-partner Ross. Now the two will need to figure out together what's next — after Wednesday, anyway. For now, their goal is beating the other Brazilian team, Talita Antunes and Larissa França, on Wednesday night.